Tomorrow is Tax Day! Whether you’ve had them done for weeks or you’re still scrambling, check out these deals happening! Great American Cookies: The national gourmet cookie shop continues its annual Tax Day tradition by offering free Cookies & Cream Cookies at participating locations Tuesday. No purchase necessary. Hot Dog on a Stick: At participating locations, get one free Original Turkey or Veggie Dog Tuesday. No purchase or “proof of completed taxes” required. Kona Ice: Tax Day is Kona Ice’s National “Chill Out” Day. Stop by the company’s island-inspired trucks during select hours Tuesday for a free cup of tropical shaved ice. Find participating hours and locations at www.kona-ice.com/chill-out-day. Piada Italian Street Food: Get a free giant blackberry lemonade at all locations Tuesday. Staples: Through April 21, get “free shredding services,” up to one pound with a coupon available at www.staples.com/coupons. Taco John’s: The chain that trademarked the term “Taco Tuesday” has a Tax Day freebie a day early. On Monday, get a free beef taco by presenting a coupon available on the Taco John’s website, rewards app, Facebook, Twitter and Instagram pages. The coupon also was sent to email and text subscribers. Applebee’s: Get $1 margaritas, which the chain calls the Dollarita, through April 30. Babbo Italian Eatery: With the purchase of a drink, get an eight-inch cheese pizza for $4.17 Tuesday. Customers need to mention the Tax Day special, which is available for dine-in or takeout orders. Bite Squad: The online and mobile food delivery service’s “tax break” is 7.5% off delivery orders Tuesday with promotional code TAXDAY18 for orders placed at www.bitesquad.com or on the service’s app. BJ’s Restaurant & Brewhouse: The day after Tax Day is the chain’s Free Pizookie Day. Get a free Pizookie with a minimum $9.95 food purchase Wednesday. Boston Market: The $10.40 Tax Day meal special includes a half chicken individual meal with two sides, cornbread and a regular fountain beverage drink, while supplies last. No coupon is needed. Bruegger’s Bagels: Now through Tuesday, get the Big Bagel Bundle for $10.40 when you sign up for a coupon at www.brueggers.com/tax-day. A “$3.50 deduction” from the regular price, the bundle includes 13 bagels and two tubs of cream cheese. Capriotti’s Sandwich Shop: The chain will offer free small to medium sandwich upgrade Tuesday to anyone who mentions the Tax Day deal. Captain D’s: On Monday and Tuesday, the chain has a $10.40 deal, which includes six pieces of its signature batter dipped fish, one family side and six pups. Chili’s: Participating locations have a $5 Cuervo Blue Margarita special for Tax Day Tuesday. No coupon is required. Just ask your server for this special offer. #LifeCouldBeEasierIf you could claim hunger as a write-off and accept refunds in Asiago. Chuck E. Cheese’s: Tuesday through Thursday, buy one large cheese pizza, get one large cheese pizza free. Cicis: Adult buffets are $4.17 Tuesday with a coupon posted on the chain’s Facebook page. Coffee Bean & Tea Leaf: Tuesdays in April are Tea Tuesdays and from 2 p.m. to close, hot and cold teas are $1 at participating locations. Corner Bakery Café: Mix and match two full-sized breakfast, lunch or dinner items for $10.40 at participating locations Tuesday through Thursday. Farmer Boys: Get two Breakfast Burritos or two “Bell Ringer Double Cheeseburgers” for $10.40 Tuesday at participating locations. No coupon is required. Fired Pie: Get any one-topping pizza for $4.17 with the purchase of a beverage or take $2 off any custom pizza or salad with a beverage purchase Tuesday. These deals are only valid at restaurant and not available for third-party delivery. 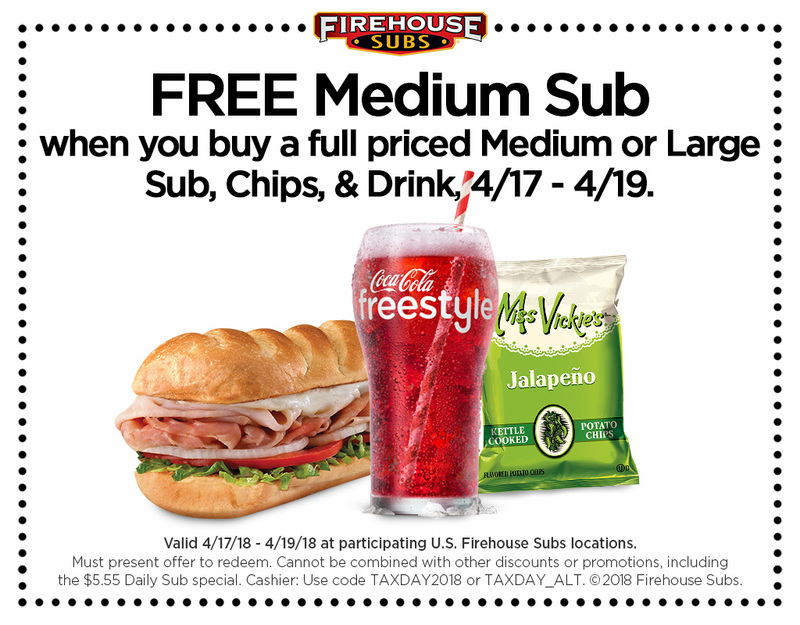 Firehouse Subs: Get a free medium sub with purchase of a full-price medium or large sub, chips and a drink Tuesday through Thursday with this coupon, which will be posted on the chain’s Facebook and Twitter pages and sent to newsletter subscribers. Sign up for the newsletter at www.firehousesubs.com/newsletter. Giordano’s: Get some dough back — a $5 coupon code for online orders — by filling out a pizza return form on the chain’s Facebook page by Tuesday. The coupon codes will be sent by April 24. Grimaldi’s Pizzeria: Get a 16-inch traditional cheese pizza for $10.40 Tuesday at participating locations. Hooters: Through Tuesday, kids 12 and younger get a free kids meal eat with an adult purchase of $10 or more at participating locations. $4 off any online order of $10 or more, starting today. Use the code TAXDAY18 at checkout between now and 4/18/18. Hungry Howie’s: Sunday through Tuesday, get a medium one-topping pizza for 15 cents with the purchase of a large one-topping pizza at regular price and promo code 18TAXDAY. This deal is for online carryout orders at participating locations. Not valid in Florida. Kings Dining & Entertainment: This Tax Day special is for “dependents.” From 3-9 p.m. Tuesday, kids 18 and younger bowl free with paying adults. McDonald’s: Participating restaurants in select locations across the country will have special Tax Day deals Tuesday. Check with your closest location. Download the McDonald’s smartphone app for additional savings. Miller’s Ale House: Kids 12 and younger eat free Tuesday with the purchase of a regular-price adult entrée. Dine-in only. Noodles & Company: Through Wednesday, take $4 off online orders $10 placed at www.noodles.com with promo code TAXDAY18. P.F. Chang’s: Get 15% off takeout orders Monday and Tuesday with promo code TAXDAY on online orders and phone orders. Pollo Tropical: Take 17% off regular menu platters Tuesday at participating locations. No coupon is needed. Potbelly Sandwich Shop: The first 75,000 people to sign up for the Potbelly Perks loyalty program, which includes downloading a smartphone app, will get a free sandwich. Current members will have a buy-one-get-one free sandwich offer loaded to their accounts Tuesday. Quiznos: New and existing Toasty Points loyalty members get 10.40% off any purchase including catering orders Tuesday. New members also get a free four-inch sub for downloading the smartphone app. RA Sushi: Buy one regular-price drink and get the second for $1 Tuesday at the largest nationwide sushi chain. Learn more at www.rasushi.com/tax-day. Rubio’s Coastal Grill: For Tax Day, the chain’s usual Tuesday taco specials are available all day instead of only during select hours. Schlotzsky’s: Get a free small original sandwich with purchase of chips and a medium drink Tuesday. Sonic Drive-In: Get half-price cheeseburgers Tuesday. Limit five per customer at participating locations. Also every day after 8 p.m., Sonic has half-price shakes, floats and ice cream slushes. Sonny’s BBQ: The barbecue chain has an IRS — Irresistible Ribs Special — Tuesday with half-price Sweet & Smokey or House Dry-Rubbed Rib dinners for dine-in and takeout. No coupon is needed. TooJay’s: The Florida-based chain is giving customers a chance to “wine” down. Get glasses of wine for $5 as well as $3 mimosas and $3 beers Monday through Wednesday. Tony Roma’s: Through Tuesday, dine-in guests who visit participating locations will receive a free Kickin’ Shrimp coupon with the purchase of an adult entrée. Tropical Smoothie Café: Download the Tropical Rewards app and register before Tuesday for “an exclusive reward,” the smoothie chain announced on Facebook. White Castle: Through Tuesday, get 15% off any in-Castle purchase. Now through April 21, get a free massage at participating HydroMassage locations nationwide on their user-controlled massage beds for the company’s 10th annual Tax Week promotion. This deal also is available at Planet Fitness gyms that have the massage beds. Visit www.hydromassage.com/taxday to find a list of participating locations and print a coupon. You’ll need to make an appointment for non-Planet Fitness locations and massages may be limited to 10 minutes. Next What’s Trending – Tax Day!